A wide variety of organic flowers, fruits, and vegetables will be on sale at the annual UCSC Farm and Garden Spring Plant Sale. UCSC Farm and Garden apprentices prepare offerings in the early morning hours of the Spring Plant Sale. Whether you’re looking to brighten your flower garden, grow more vegetables, or add an apple tree to your yard, you’ll find something to satisfy your green thumb at the UCSC Farm & Garden’s Spring Plant Sale, featuring organically grown herb and flower starts, vegetables, fruit trees, and beautiful perennials. 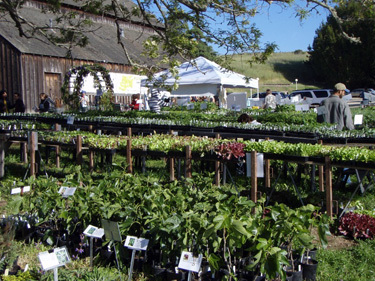 The Spring Plant Sale takes place Saturday, April 30, and Sunday, May 1, in the Barn Theater parking lot at the base of the UC Santa Cruz campus, near the intersection of Bay and High streets in Santa Cruz. The sale will be open on Saturday from 10 a.m. to 3 p.m., and on Sunday from 10 a.m. to 2 p.m. On Saturday, members of the Friends of the Farm & Garden enjoy priority early entry starting at 9 a.m. (memberships and renewals available starting at 8:30 a.m.). Plant sale patrons will also enjoy discounts at several local businesses. Penny Ice Creamery, El Salchichero, and Companion Bakers will offer 10 percent off purchases on presentation of a plant sale receipt during the week after the sale. On Saturday, plant sale shoppers can try out handcrafted popsicles from Penny Ice Creamery featuring ingredients from the Farm & Garden. This spring’s sale will feature a great selection of tomatoes, peppers, eggplants, summer squash, pumpkins, alliums, and other vegetables. Back this year are potato starts ready for planting, along with other high-nutrition crops such as kale, chard, and collards. For flower lovers of all ages, sunflowers take center stage. This year’s offerings include a range of tantalizing varieties including the mammoth ‘Titan’, edible ‘Snack Seed’, classically colored ‘Van Gogh’, diminutive ‘Music Box’, and multi-stalked ‘Cinnamon Sun’ for wonderful bouquets. Other great bouquet ingredients to be offered include asters, cosmos, foxgloves, marigolds, Mexican sunflowers, poppies, snapdragons, statice, and stock, many grown from seeds generously donated by Renee’s Garden Seeds. Tomato fans will be especially pleased by the many heirlooms, slicers, and cherry and paste varieties available, including ‘Striped German’, ‘Black from Tula’, ‘Mortgage Lifter’, ‘Rainbow's End’, ‘Chianti Rose’, ‘Green Zebra’, ‘Crimson Carmello’, ‘Sungold’, ‘Isis Candy’, ‘Summer Feast’, ‘Sunset Olive’, ‘Yellow Pear’, ‘San Marzano’, ‘Amish Paste’, ‘New Girl’, ‘Pruden's Purple’, ‘Pompeii’, ‘Oregon Spring’, ‘Big Beef’, ‘Brandywine’ (red and yellow), and ‘Cherokee Purple’. Also among the annual vegetables this year will be selections of both sweet and hot peppers, along with a variety of lettuces and salad mixes, Italian and Asian eggplants, strawberries, cucumbers, artichokes, leeks, winter squashes, and gourds. An expanded basil collection will add wonderful flavor to your summer sauces and other meals. Look for ‘Ms. Burns Lemon’, ‘Nufar’, ‘Cinnamon’, ‘Profumo di Genoa’, ‘Genovese’, ‘Italian Pesto’, and ‘Sweet Green’. New to this year’s sale are apple trees in 1-gallon containers, all grafted on M111 rootstock, an excellent all-around rootstock for apples. Varieties available include Ashmead's Kernel, Cherry Cox's Orange Pippin, Fiesta, Freyberg, Gravenstein, Hatsuaki, Hooples Antique Gold, Hudson's Golden Gem, Jonagold, and Sunrise. Also choose from hundreds of perennial species, including lavenders, salvias, and California natives, along with yarrows, butterfly bushes (Buddleias), irises, heucheras, and native Ribes, oak trees, California buckeye, and coast silk tassel. Rose enthusiasts will find a range of offerings, including the hybrid musks ‘Will Scarlet’ (bush form) and ‘Penelope’, the climbers ‘Autumn Sunset’, ‘Blaze of Glory’ and ‘Constance Spry’, the floribundas ‘Bonica’, ‘French Lace’, ‘Ice Berg’, and ‘Sarabande’, the hybrid tea ‘Sun Struck’, and the popular ‘Queen Elizabeth’. The Spring Plant Sale benefits the UCSC Farm & Garden Apprenticeship, a six-month training course in organic farming and gardening run by UCSC's Center for Agroecology & Sustainable Food Systems. Members of the Friends of the UCSC Farm & Garden receive a 10 percent discount on purchases; memberships will be available at the sale beginning at 8:30 a.m. on Saturday and 10 a.m. on Sunday. Plant purchases will help grow the next generation of organic farmers and gardeners. For more information about the Spring Plant Sale or the Friends of the Farm & Garden, call (831) 459-3240, send email to casfs@ucsc.edu, or see http://casfs.ucsc.edu, where you can find a list of the plants available for sale this year.